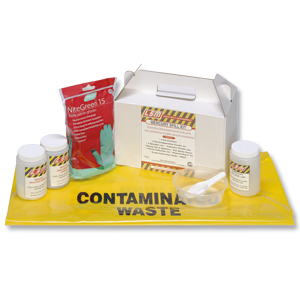 This Kit will quickly and easily absorbs mercury spills of up to 50 mL. The 500 grams of Mercsorb powder in the kit forms a paste and absorbs the mercury into a low-toxicity zinc amalgam. Use the Mercsorb powder with the sponges and jar to completely and safely remove a mercury spill. • Most small liquid Mercury spills. • Use PPE to ensure correct safety procedures are followed, including appropriate ventilation or respiratory protection.